On onions, and faking it. I first learned of Impostor Syndrome through my friend Grace. I think it might be contagious. 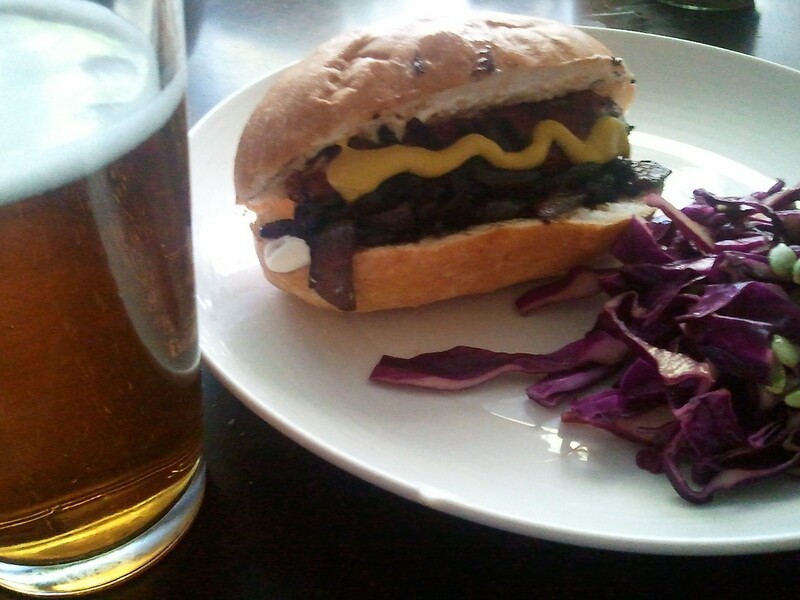 Today Nick went to the butcher and bought some spicy bratwurst, which he thought would be delicious on buns. “You’ll fry up some onions, right?” he said, and I agreed I would. 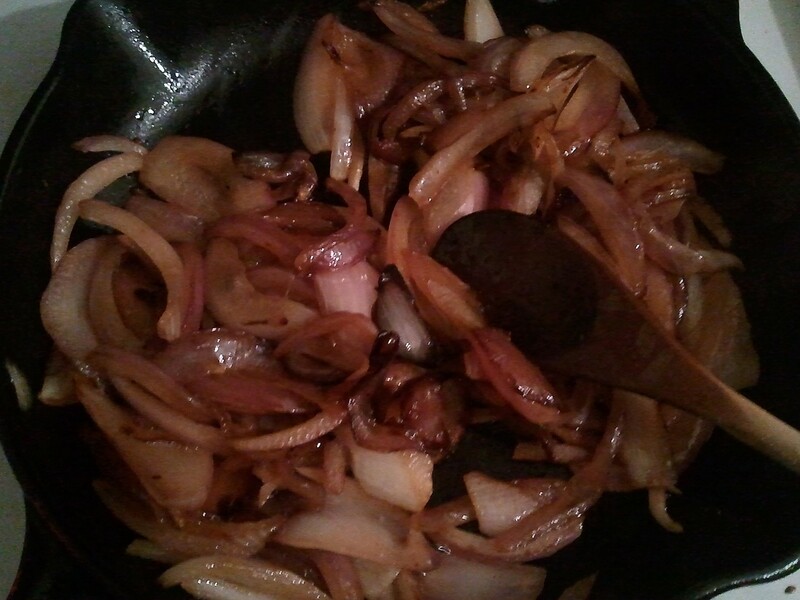 Every time I try to caramelize some onions, there is a point in the middle where I am sure it isn’t going to work. It is the part where some of the onions are dark and shrunken, but most of them are still thick with little to no browning. 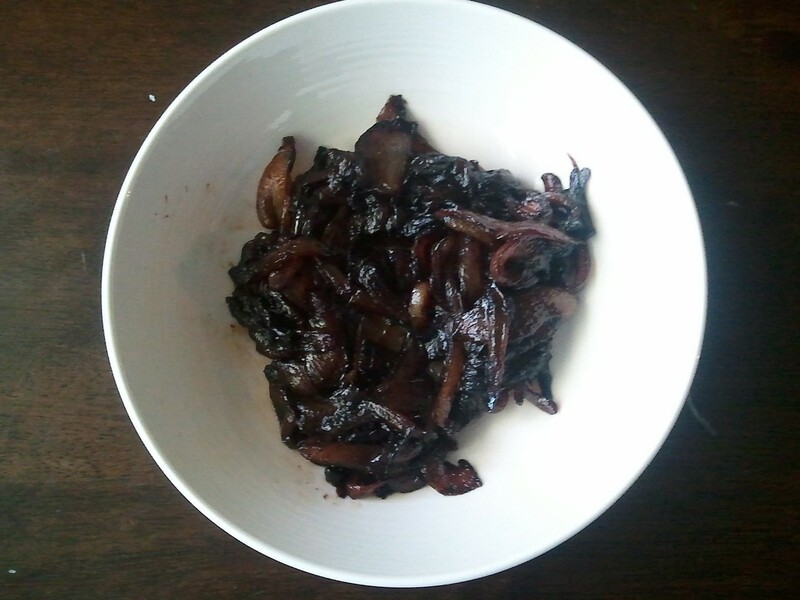 Every time, I am certain that I cannot do this, that every time that I have ever successfully caramelized an onion in the past has been an accident, a fortuitous mistake. I am not good at anything, despite any evidence to the contrary. This is a recurring theme, most notably at work, and at home with Toddler. At work, I am faking it. Despite having been gainfully employed for 50% of my life to date, I still feel like an amateur; what do I know about anything? I am barely even an adult, even though I’m 30. I am making it all up as I go, bluffing my way through meetings and reports and projects. Who am I to call myself an authority? I don’t know anything. Half-way through my current contract, I am certain this is never going to work. And with Toddler, this feeling of incompetence is amplified. The kid doesn’t eat. He is growing, and he is not skinny, but I am never sure that he has gotten enough nutrients, and surely by not fighting him hard enough we are stunting his growth and knocking points off his future IQ. He prefers baked goods – sweet carbs like muffins, doughnuts, banana bread; today he went to a birthday party and was handed a hot dog. He discarded the wiener and ate the whole bun and then some cake. 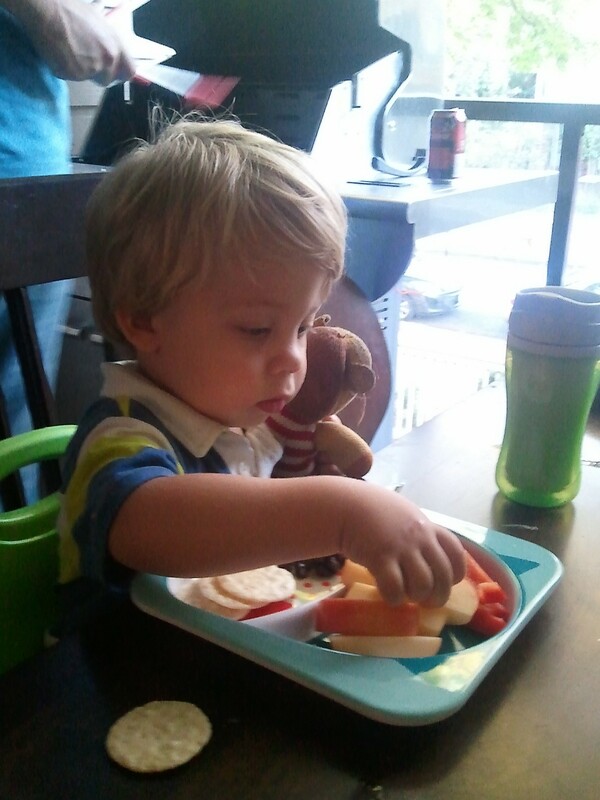 For dinner I gave him maple breakfast sausage in small pieces, crackers, red peppers, apples and raisins. He ate the apples and raisins, a few bites of the crackers, and threw the rest on the floor. 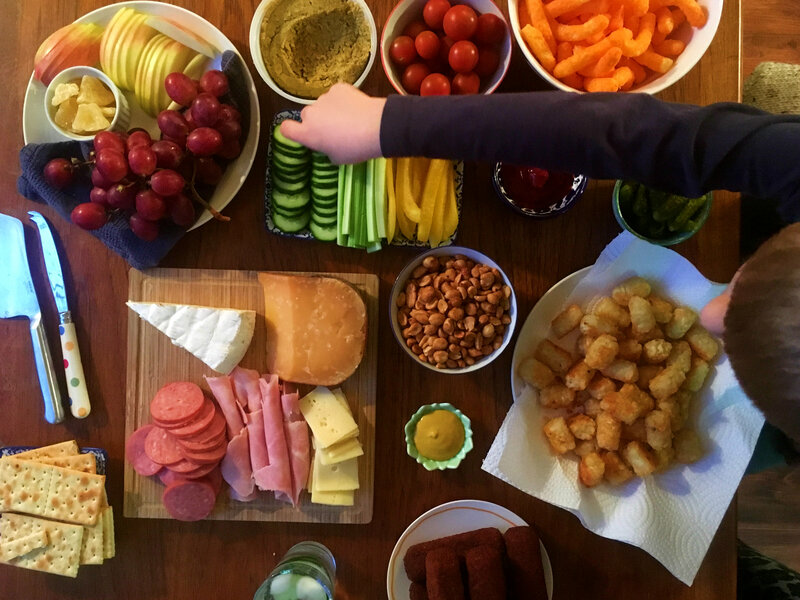 I write about food, but my own child won’t eat. This can’t be just my problem. We are all faking it, aren’t we? At what point do we begin to feel like fully fledged grown-ups who know their own ish? Intellectually, I know if I keep turning the onions over medium heat, eventually they will brown. And still, I am sure every time that it isn’t going to work. 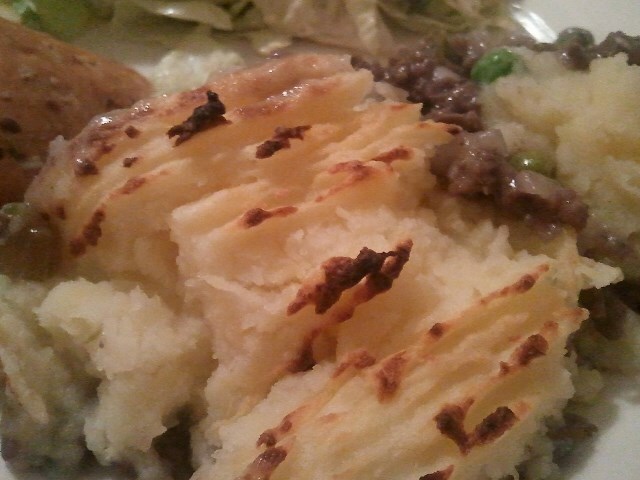 I have done it wrong, chopped the onions too thick, and it is so easy to do right – how could I have failed? And still, they turn out. They brown, they soften, they are delicious on buns with bratwurst and I am silly. With patience, they turn out every time. Am I alone on this? Or are we all impostors? When do we start to feel like we know what we are doing? You know when you finally do something you’ve been wanting to do for a long time but for whatever reason you kept not getting around to it, and then when you finally do get around to it you feel so silly for having waited all that time? For me, the thing was bacon. 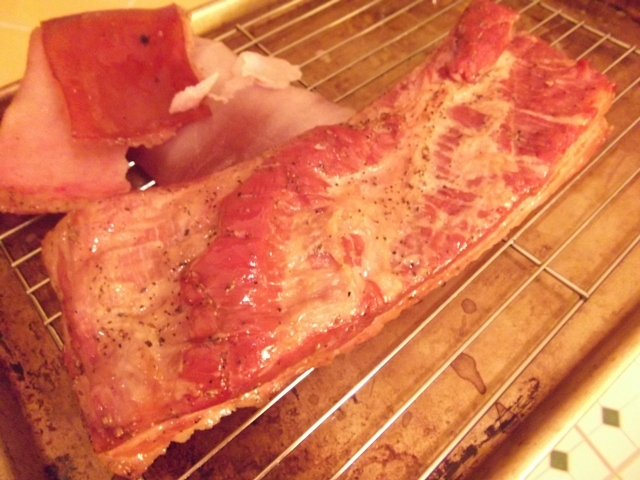 Homemade bacon, which I always knew you could do but put off because for some reason the thought of finding curing salt was rather daunting, even though I knew you could buy it literally three blocks from my apartment. I don’t know. 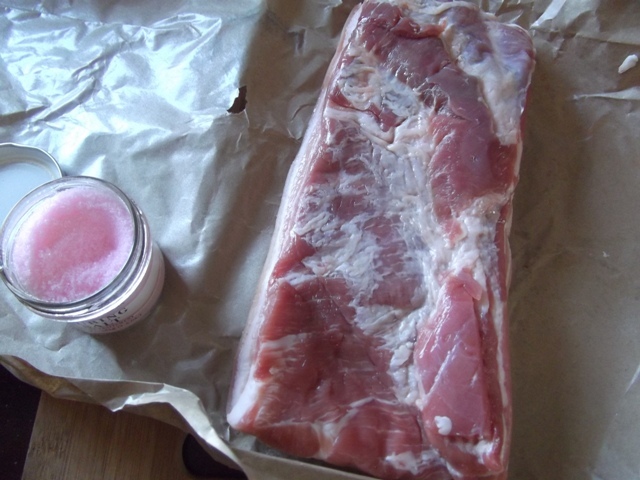 I think I figured once I had the pink salt, I’d have to commit, and then what if I wasted my money and half a kilo of pork belly? There was a lot to consider, and the threat of failure and food poisoning put me off. 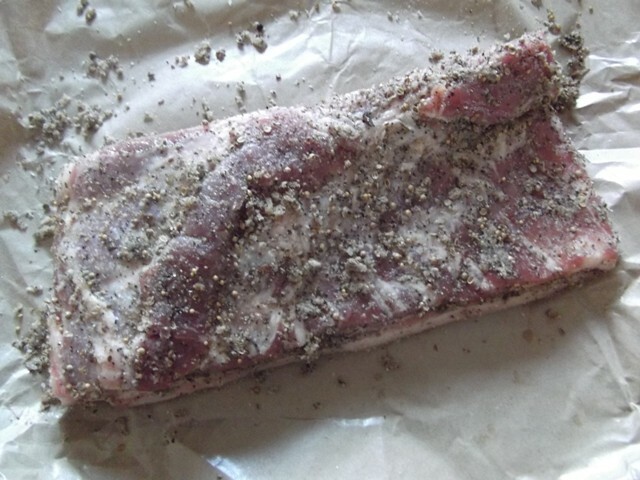 Then a couple of weeks ago the director at work told me about a butcher shop that her French cooking teacher recommended and I went there to buy something else, and there, in its fatty, rosy glory, I found just over two pounds of local pork belly, just the right amount to make my first batch of bacon. 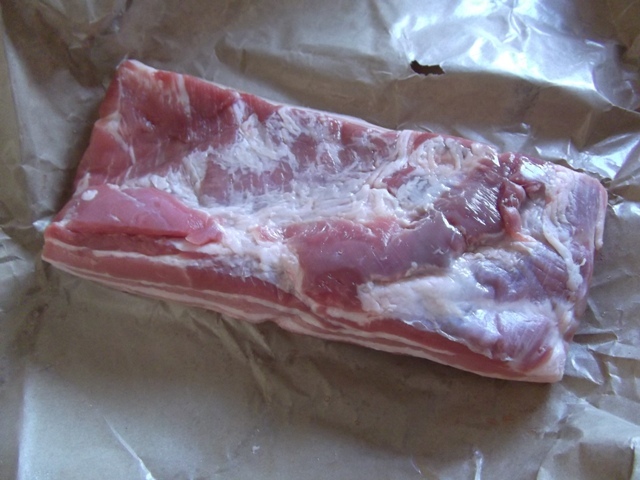 I found a Michael Rhulman recipe, and bought my pink salt, and in about ten minutes I had done everything I’d need to do to the meat to make it bacon. After that, it would need seven days, and to be mostly left alone. I feel silly for having waited all this time. 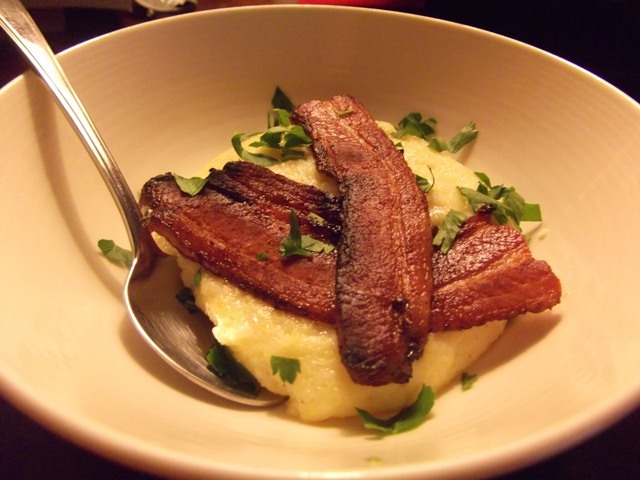 The result was impressive, meatier than regular bacon and not as salty, with a pronounced garlickyness that was thrilling – garlic and bacon go almost as well together as bacon and cheese. 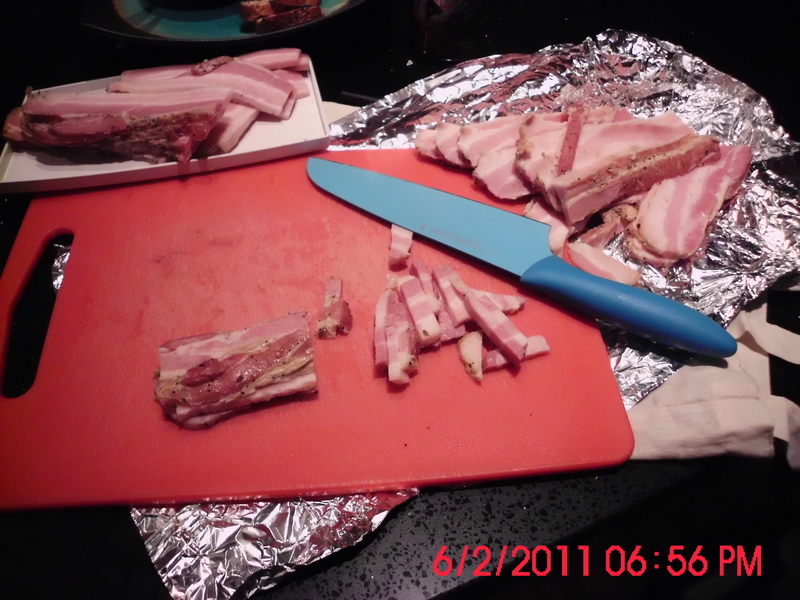 I cut it thick, about an eighth of an inch (my parents have a meat slicer they let me use … *mental note: add meat slicer to wish list*), but it would last longer in thinner strips (some of us never learned when to say no). Bacon might just be a gateway charcuterie. One cannot simply stop at a slab of cured pork belly; there’s pancetta to think about, and guanciale, and corned beef, and sausage … I already have plans to convert a wine fridge I got as a wedding gift to a climate-controlled curing chest, and even though our apartment is already crowded with kitchen tools and the hydro bill grew exponentially with the addition of the deep-freeze, Nick is okay with this – he stopped just short of encouraging me. For him: salumi. I’m asking for Charcuterie for Valentine’s Day, which we don’t usually celebrate but neither of us has a greater love than cured or smoked meats – I am not exaggerating when I say Nick would trade me for my weight in bressaeola, and I’d happily swap him for a lifetime’s supply of jamón ibérico de bellota – and I can’t quit now. But I’m getting ahead of myself. Big plans, no direction: story of my life. Have you done this before? 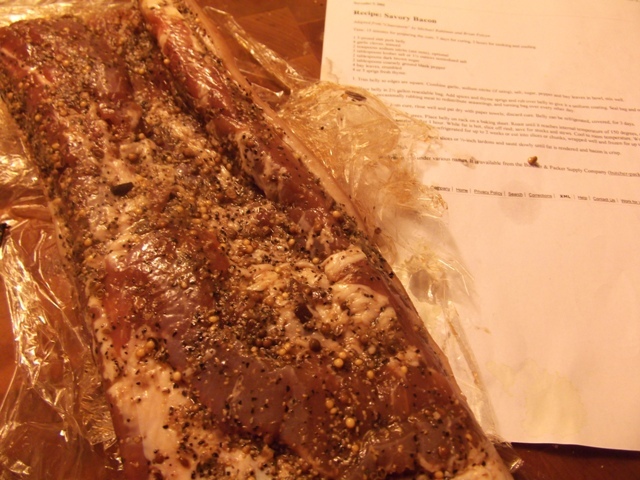 Have you cured, smoked, dried, or otherwise preserved meat and made it more wonderful with salt and spices and air? Have you done it at home? Can you teach me? At this point I fear nothing, not food poisoning or living in an apartment that smells like a delicatessen, and there’s no going back to store-bought bacon. 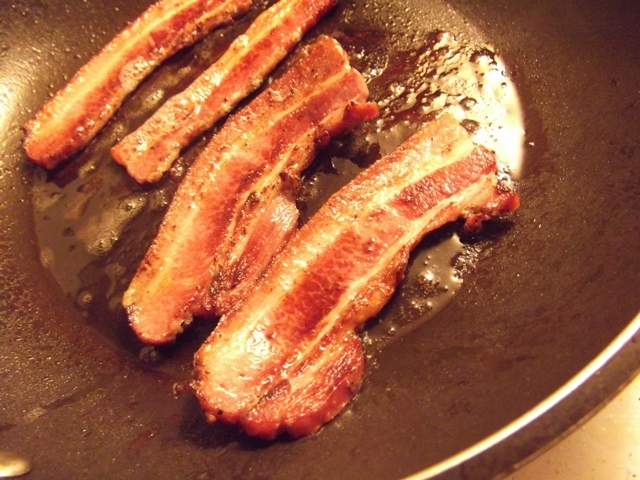 And if you haven’t made bacon at home? Don’t wait any longer. Start your first batch today. When speaking of this site, Nick and I call it Bloggy, affectionately as it is a large part of our existence. “Will it go on Bloggy?” Nick asks when dinner is good. Well, today is Bloggy’s second birthday. 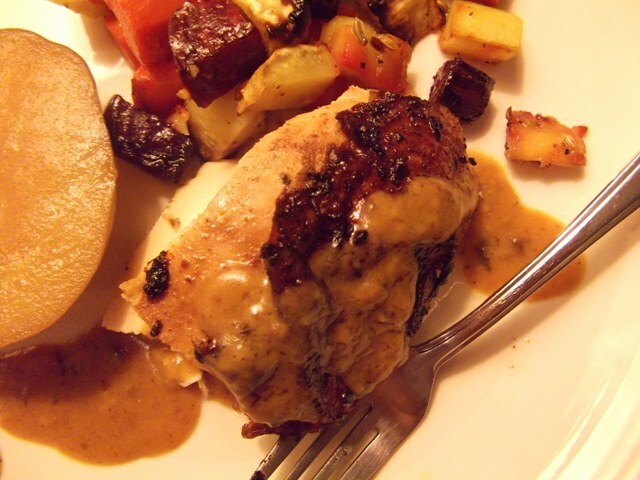 We celebrated with an update to the roast chicken I wrote about in my very first post. It’s strange, but this week has felt just as long as it did the first time I wrote, and just as much now as then, we both felt that spicy roast chicken would solve all our problems and be just the thing to help us move into another seven days. Chicken’s magical the way it does that, isn’t it? Well, maybe not, considering the part wine plays. In two years, my paprika roast chicken has undergone some changes. I’ve streamlined the process and added butter, so now you simply slather the chicken in a paste of spices and butter, and roast it with a bit of white wine for 90 minutes in a 425°F oven. The last part is because of Ina Garten, who roasts her chickens in a similar way, and who is right about how to do things quite a lot of the time. To roast a chicken in this way is to save yourself steps, time, and fussing; the result is a meal that makes itself (save for a couple rounds of basting when you’re passing through the kitchen to refill your wine glass – if you’re like me, in 90 minutes you will do this three or four times and if it’s the weekend you may need to open a second bottle but that’s okay because you’re cooking and cooking is art). 1 whole chicken, 4 to 5 lbs. Let chicken rest at room temperature for an hour. Preheat oven to 425°F. 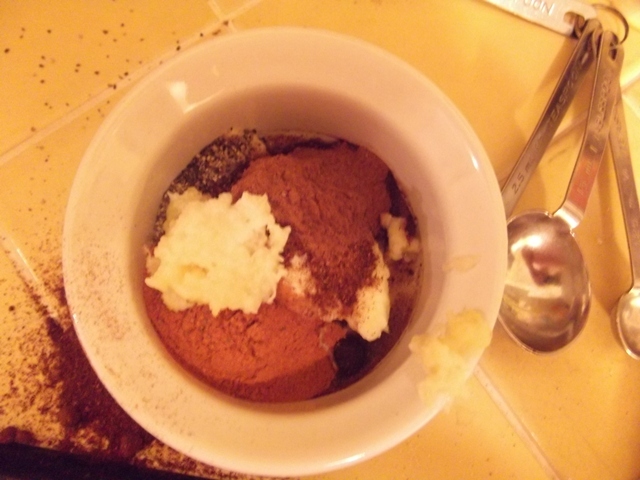 In a small bowl, combine butter or oil, garlic, paprika, cayenne pepper, cinnamon, black pepper, and salt. 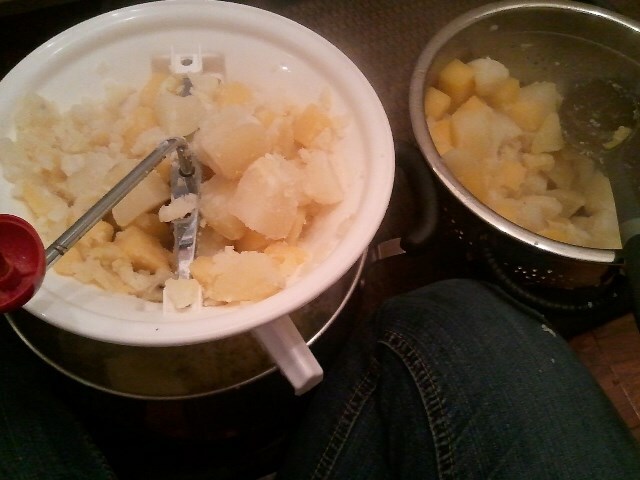 Mush together with a fork until the mixture forms a paste. Using your hands, slather the paste all over the chicken, sliding your fingers under the skin to rub the paste into the breast, legs, and thighs. 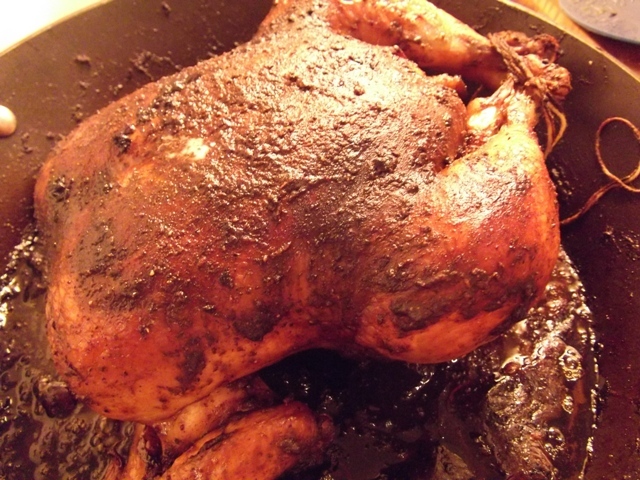 Wash your hands, then truss the chicken, folding the wing tips behind the bird, and place it into a roasting pan. Pour wine into the bottom of the pan. Optionally, you could throw in some chopped carrots or onions at this point. Sweet potatoes would also be lovely. Roast the chicken for 90 minutes (or 18 minutes per pound), until the juices run clear when you cut into the spot between the leg and thigh. 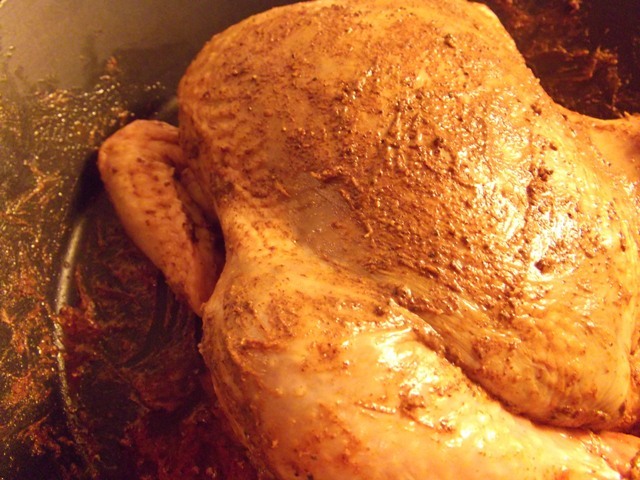 Baste periodically, adding additional wine or water as needed to moisten the bottom of the pan. Remove from oven and tent with tin foil. Let rest 20 minutes before serving. You can make a spicy, luscious gravy by tossing a handful of flour into the pan drippings and stirring in a bit of milk or cream. If there are leftovers they are wonderful in pozole, and the carcass makes a glorious stock. 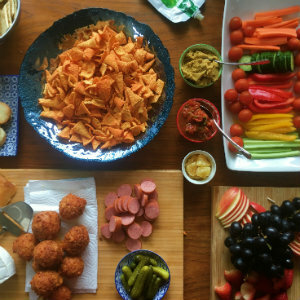 One of the first dinners I ever made came from one of my mom’s Company’s Coming cookbooks – I don’t know if you can get those books in the states, but at one time everyone’s Canadian mother had them; I remember a row of them in the pantry cupboard, each book’s plastic spiral-bind a different colour. 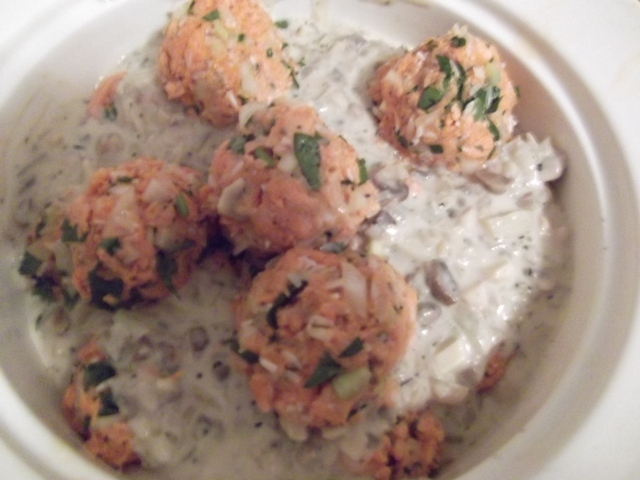 The recipe was for “Salmon Balls,” which I’ll admit does not sound tremendously appetizing. But it was, as it was little more than rice, canned salmon, and Campbell’s Cream of Mushroom soup. 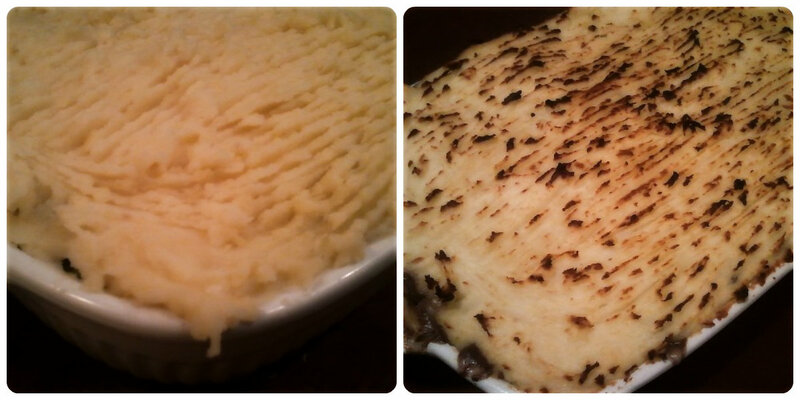 It was salty, creamy, and very comforting – perfect for one of these Canadian Januarys. Of course, some things have changed, and around here we’re not really big on canned soups or heavily processed foods in general. I believe very strongly that if something’s going to be bad for you, it should be bad for you for the right reasons. This is why there are things like triple-creme brie, bacon, and bourbon. Besides, this version isn’t really bad for you, if you don’t eat it all the time. 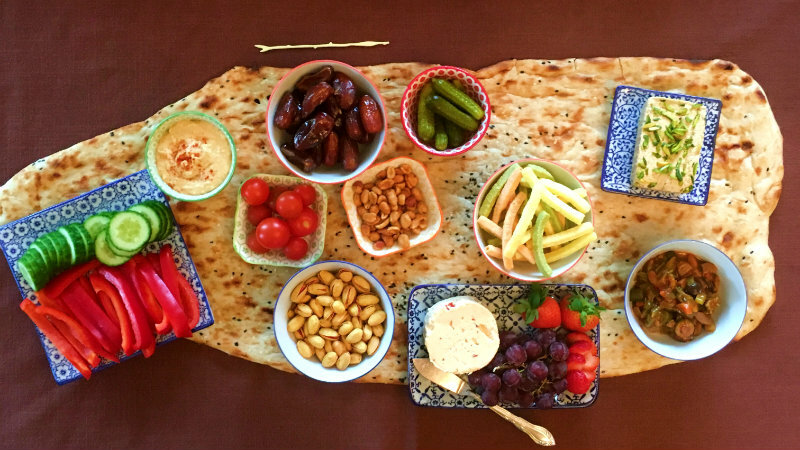 The ingredients are pronounceable, and you can easily substitute the things you aren’t sure of. Where I used a cup of sour cream, you could just as easily use yogurt; where I used white rice, you could use brown and adjust the cooking time. 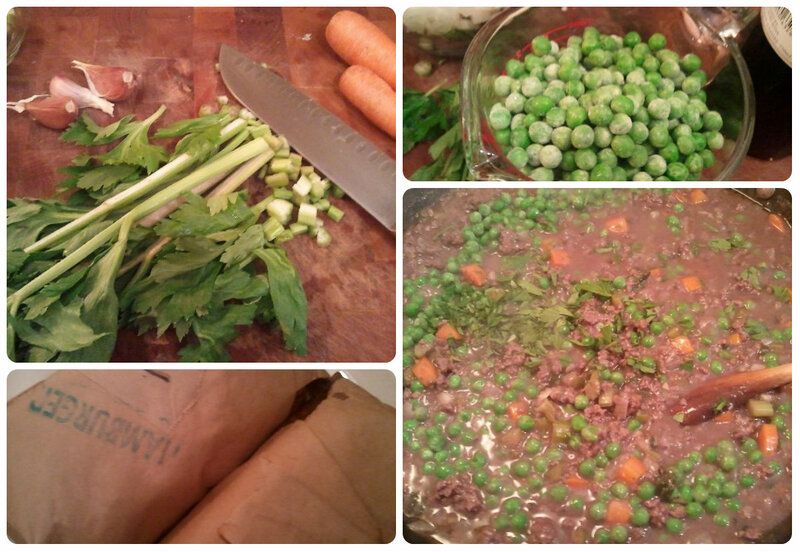 I’ve also crammed a few extra veggies in, so bonus points for that. 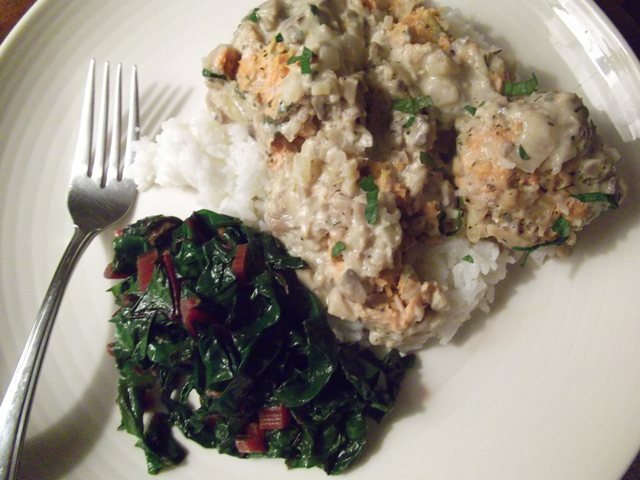 Also, this easily uses up a plateful of leftover fish, which earns you double bonus points. But since it’s January and the whole city’s covered in a thick slurp of beige slush, there’s little reason not to go ahead and use the sour cream and white rice. Maybe you also have a hole in the sole of your boot and your work pants didn’t make it into the laundry this week and your hair just hates this weather – there are so many reasons to indulge right now, and who’d blame you? 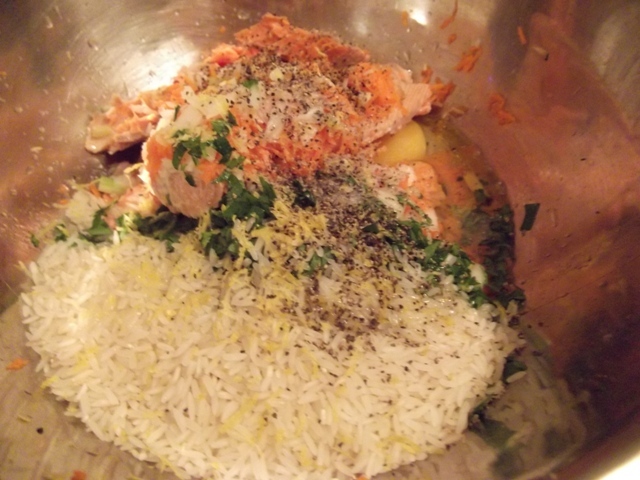 In a large bowl, combine salmon, rice, carrot, onion, celery, parsley, lemon zest and juice, eggs, olive oil, salt, and pepper. Mush the whole thing together with your hands until thoroughly combined. 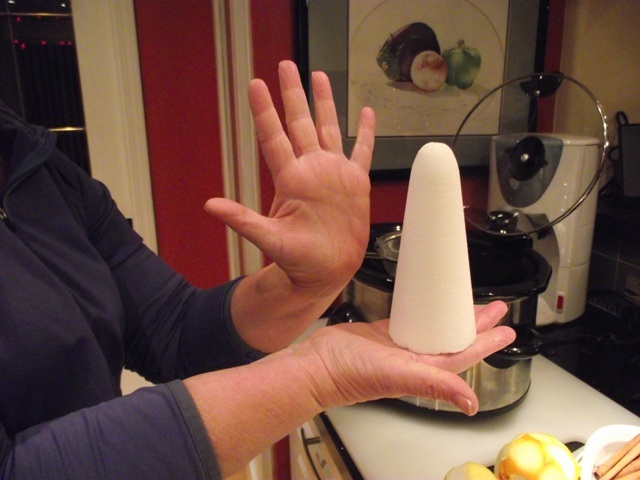 Form into balls about an inch and a half in diameter (you should end up with 14 to 16), and set aside. 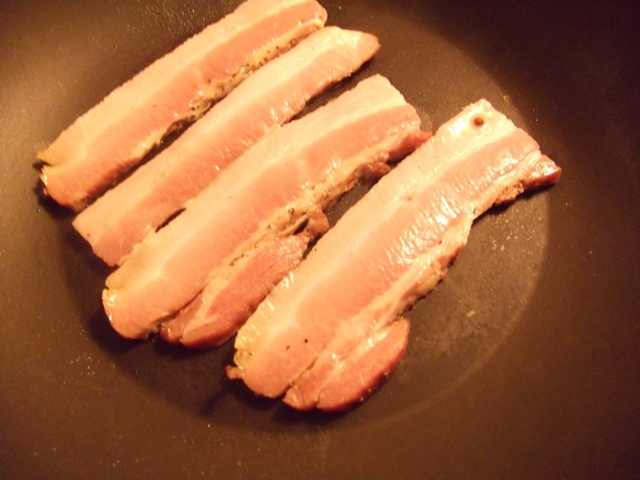 In a large pan over medium-high heat, add oil and onions and cook until onions are translucent, three to five minutes. Add garlic, mushrooms, savory, Worcestershire sauce, pepper, and cayenne, and cook until mushrooms have sweat and no liquid remains in the bottom of the pan, about another five minutes. Add flour, stir to coat, and then add milk and sour cream. Cook until liquid comes to a gentle boil. Taste, and adjust seasonings as needed. 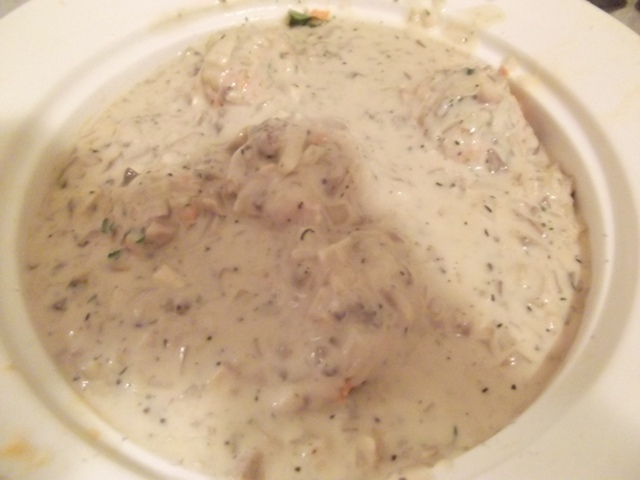 Ladle a small amount of the cream sauce into the bottom of a 1.5- to 2-quart casserole dish. 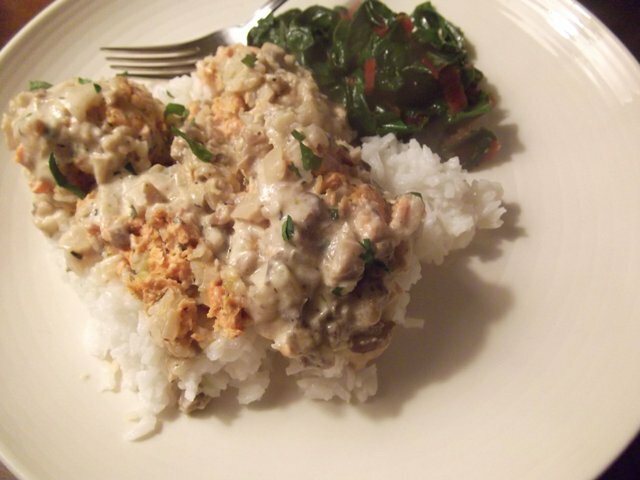 Line the bottom with a layer of balled salmon, then ladle half of the remaining sauce over top. Place remaining salmon balls over top, and then top with remaining sauce. Cover, and bake for one hour. If you’re using a casserole dish that doesn’t have a bit of an edge to it, place the dish on top of a cookie sheet before putting it in the oven, as the sauce will bubble up around the sides. Serve over rice, with a sprinkling of fresh parsley. 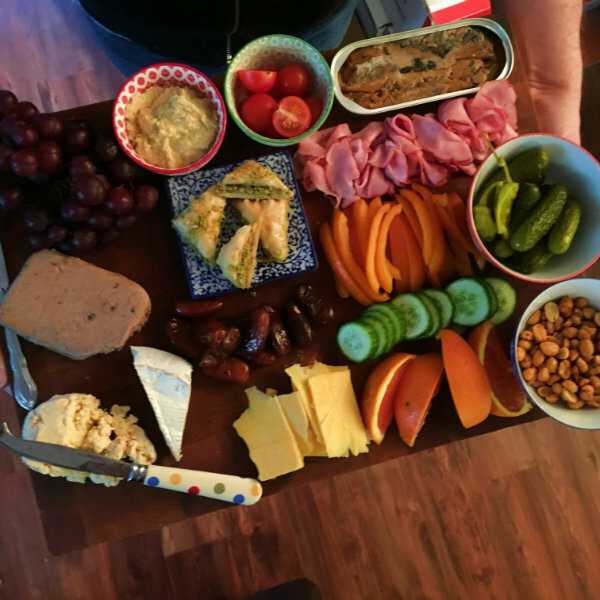 Also, if you haven’t voted and my relentless (if self-conscious) badgering hasn’t turned you off this blog completely, please visit the Canadian Food Blog Awards voting page and select Well fed, flat broke. Voting will close this Saturday, January 15. After that, I’m pretty sure we’ll go back to business as usual. 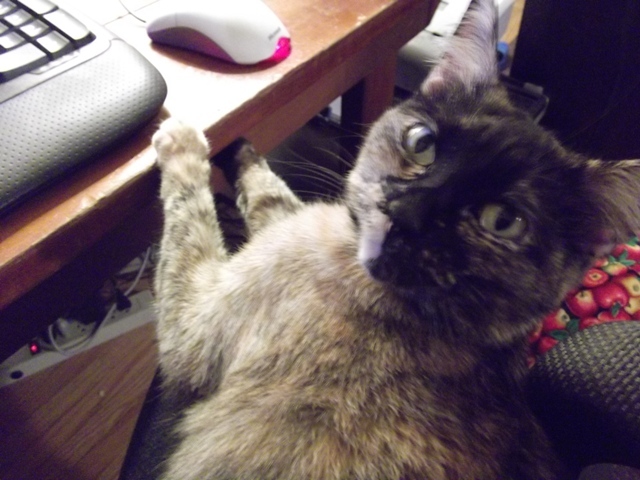 Which, you know, means a lot of photos of my cat, which are completely out of context for a food blog. A few weeks ago my mom and I went on our annual holiday outing to Christmas shop and eat and generally be merry, and we went to the Vancouver Winter Market beside the Queen Elizabeth Theatre downtown because the ad said there would be food and festivity and because this was the first time we’d ever heard of the thing. When we got there, the first thing we saw was a kiosk dispensing something German we couldn’t pronounce, but it smelled good so we put a deposit on a pair of mugs and had our first round. Feuerzangenbowle, the thing we got, is mulled wine with cinnamon, cloves, star anise, orange, and rum, and when I did a bit of research I discovered that it’s also something that involves fire, which stirred my mild pyromaniacal urges in the best possible way. 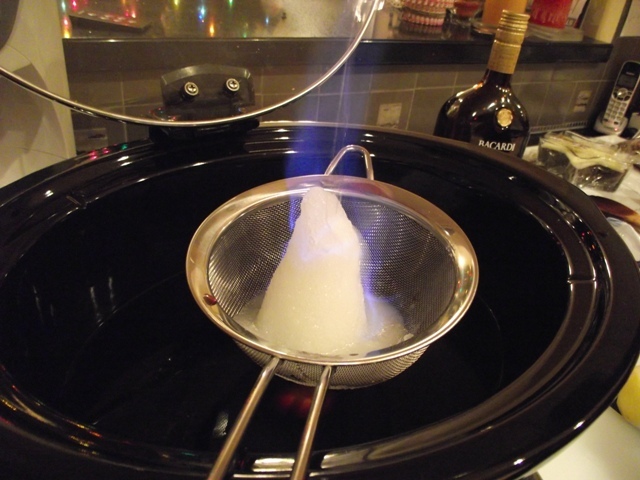 The most important thing about feuerzangenbowle is zuckerhut, a sugar cone which is doused repeatedly in rum and set on fire above the heated wine mixture. The sugar caramelizes and melts into the wine, and the result is magic. I wanted to create this on Christmas, so I asked Brigitte, a German lady I work with, how to spell the thing I wanted to make (I still can’t, and pulled the name from the email she sent me, which also included this recipe for “rumtopf,” which I also must make) and where to buy the zuckerhut. I ended up not being able to find it in town, but she would be going to Greco’s Specialty Foods in Surrey and she had called and found that they had some, and she would pick one up for me. And she did. 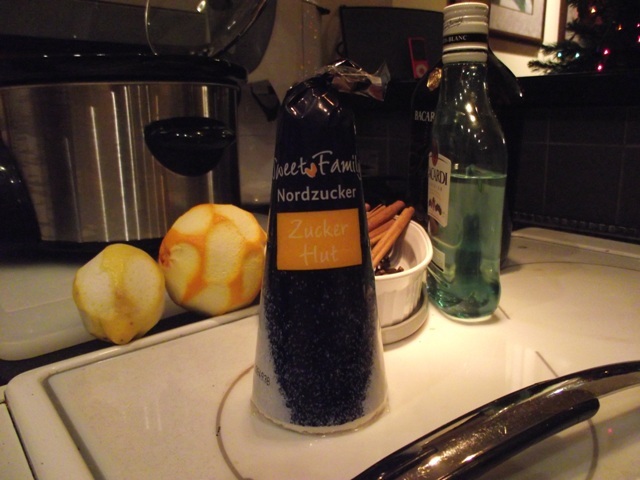 To find zuckerhut, visit your local German deli; if they don’t have it, they may be able to order some in for you. 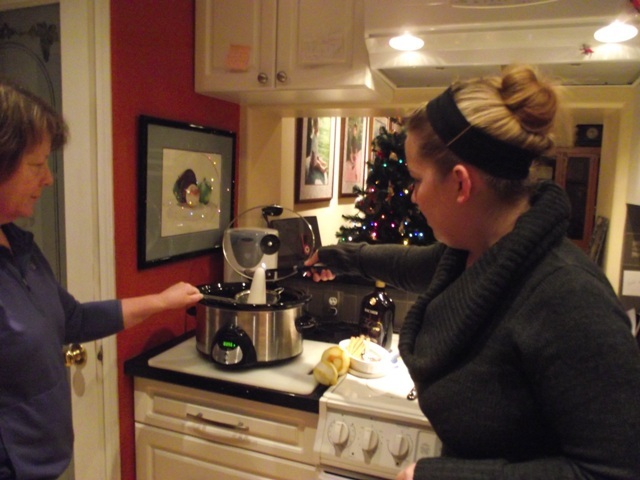 And so, on Christmas Day, we poured two bottles of cheap, off-dry red wine into a Crock Pot, and set it to heat for an hour. We added strips of orange and lemon peel, and two cinnamon sticks and two cloves to the pot and let it simmer with the lid on; next time, we’ll add two star anise pods and slice the orange and lemon into the pot so that the fruit flavour is more pronounced. 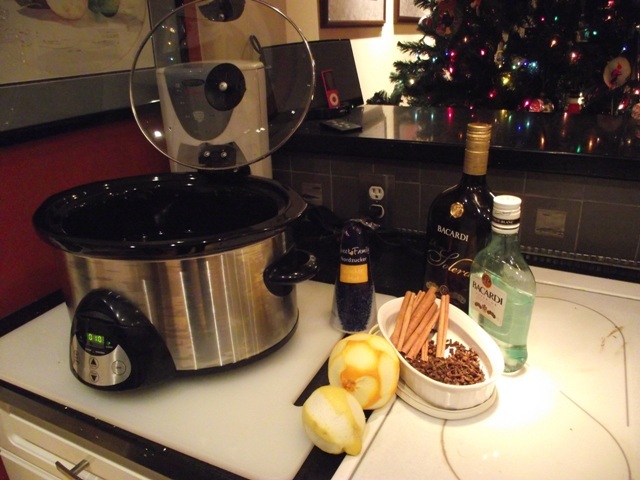 Our adapted recipe comes from this one from WikiBooks, but deviates significantly enough that I’m okay calling the recipe below an original interpretation – we wanted it to taste like the drink we had at the Winter Market, and I think we made it work. After an hour, we placed the zuckerhut in a wire mesh strainer and held it over the pot. We poured rum over top, and then lit the cone on fire. It was awesome. We ended up using about a cup and a half of rum; the cheap white stuff worked better than the good amber stuff for burning. When there was no more rum and we couldn’t light the sugar on fire anymore, we stirred the remains of the cone into the pot and let it dissolve. We served it in mugs immediately, and felt very warm and delighted and then had naps. Heat wine with cinnamon sticks, cloves, star anise, orange, and lemon slowly. 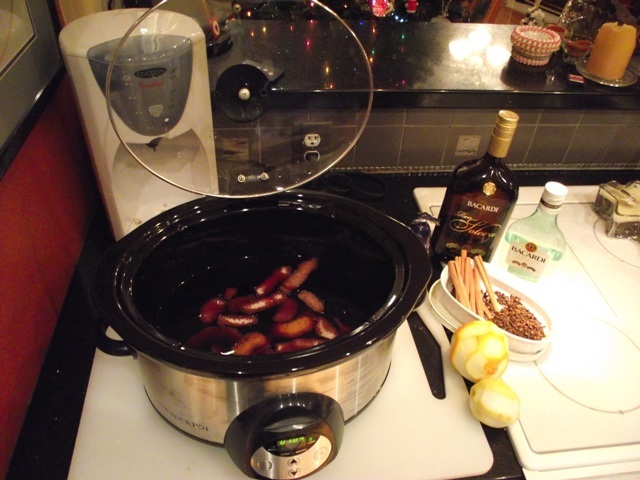 If using a Crock Pot, set on high heat and let sit for about an hour. Do not bring to a boil. 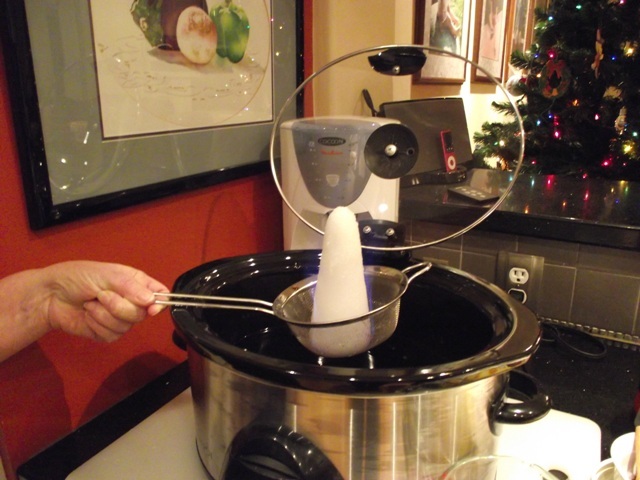 If heating on the stove, heat over medium-low heat, covered, for 30 to 40 minutes. Suspend zuckerhut in a wire mesh strainer (one that has no plastic on the edges of the strainer). Pour two tablespoons of rum over top, ignite, and continue feeding the flame with small amounts of rum until no rum remains. Do not pour rum directly from the bottle. Stir any remaining sugar from the zuckerhut into the pot, test temperature, and if it’s warm enough to serve, ladle the drink into mugs.